Plants annual. Taproots filiform. Stems 1-100+, erect to ascending or sprawling, green, 3-40+ cm; internodes terete to ellipsoid, 2-8 times as long as leaves, dull, retrorsely pubescent throughout, sometimes also stipitate-glandu-lar. Leaves often connate basally, with scarious or mostly herba-ceous sheath 0.2-0.3 mm, petiolate (proximal leaves) or usually sessile; petiole 1-4 mm; blade 3-5 veined, elliptic to broadly ovate or rarely orbiculate, 2-7 × 1-4 mm, herbaceous, margins flat, herbaceous, dull, ciliate especially proximally, apex acute to acuminate, pustulate, sparsely minutely pubescent or glabrous; axillary leaf clusters absent. Inflorescences terminal, open, leafy, 3-50+-flowered cymes. Pedicels erect or ascending in fruit, 1-12 mm, retrorsely pubescent. Flowers: sepals green, often prominently 3-veined, not keeled, lanceolate to ovate-lanceolate (herbaceous portion narrowly elliptic to broadly lanceolate), 2-3 mm, to 4 mm in fruit, apex narrowly acute to acuminate, ± minutely pustulate, stipitate-glandular; petals oblong, 0.6-2.7 mm, 5- 4 times as long as sepals, apex obtuse to rounded. Capsules loosely enclosed by calyx, ovoid to cylindric-ovoid, 3-3.5 mm, 5-1 5 times as long as sepals. Seeds 10-15, ashy black, reniform, plump, 0.4-0.6 mm, not shiny, with low-elongate, prominent tubercules. Variation in Arenaria serpyllifolia in the broad sense is treated in various ways. The two varieties recognized here have been treated also as subspecies (e.g., A. O. Chater and G. Halliday 1993) or species (e.g., M. N. Abuhadra 2000; B. Jonsell 2001). Jonsell admitted that accepting them as species is questionable; while the morphological differences are slight (see esp. Abuhadra), the ploidy-level difference (2n = 40 in var. serpyllifolia vs. 2n = 20 in var. tenuior) is important. Annual herb with a taproot 5 - 40 cm tall Leaves: opposite, in eight to ten pairs, widely separated along the stem, mostly stalkless, 2 - 8 mm long, 1 - 5 mm wide, egg-shaped with a pointed tip, three- to five-veined, sometimes sparsely minutely hairy. Inflorescence: an open, leafy cluster (cyme) of three to fifty flowers. Flowers: white. Stalk slender, 4 - 12 mm long, and hairy. Stamens ten. Styles three. Sepals: five, 2 - 4 mm long, usually longer than the petals, lance-shaped to egg-shaped with a pointed tip, three- to five-veined, minutely rough-hairy or glandular. Petals: five, white, 0.6 - 2.7 mm long, usually shorter than the sepals, oblong with a blunt to rounded tip. Fruit: a dehiscent capsule (opening by six teeth), about 3 mm long, egg-shaped to conic. Seeds ten to fifteen, grayish black or reddish brown, plump, kidney-shaped. Stems: one to many, clustered, upright to ascending or sprawling, minutely hairy and sometimes also glandular. 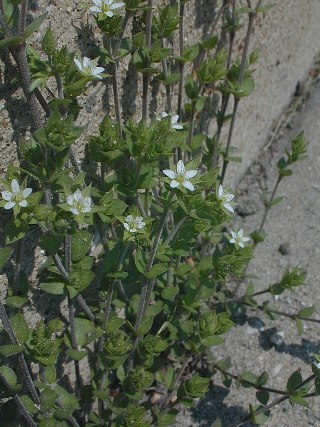 Similar species: The lance- to egg-shaped leaves (usually over 2 mm wide) help distinguish this species and Arenaria lateriflora from all other Arenaria in the Chicago Region. Arenaria lateriflora differs by having lance-shaped to elliptic leaves (with blunt or rounded tips) that are more than 1 cm long and 5 mm wide. Habitat and ecology: Introduced from Europe. Very common in disturbed sandy soil, such as sandy paths, roads, and cemeteries. Etymology: Arenaria comes from the Latin word arena, meaning sand, referring to the fact that most species in this genus prefer sandy habitats. Serpyllifolia means "with leaves like Thymus serpyllum."